How much does Chatterbug cost? How much do I need to study? Is Chatterbug only for beginners? Do I need to take Live Lessons? Can I only take Live Lessons? How do I coordinate with tutors to schedule lessons? Are the Live Lessons recorded? What does Chatterbug do with the lesson recordings? What if I don't want to be recorded? Can I do several language courses simultaneously? Does Chatterbug offer group classes? Will I always have the same tutor? Can I be a tutor? What do I have to do as a tutor? How much will I get paid to be a tutor? Do I need to have teaching credentials? Do I need to bring my own curriculum? Will the video lessons be recorded? When will you approve my tutor application? Do you offer plans for businesses? Chatterbug is an online language learning system with two parts: Self-Study and Live Lessons. Self-study is time spent on activities like study cards, readings, audio and video media, and writing practice in Chatterbug. Live Lessons are guided, 45 minute one-on-one video chats with a native speaker of the language you are learning. Chatterbug offers the effectiveness of private language tutoring and the flexibility of online study. Study when and wherever you like! Currently Chatterbug offers German and Spanish courses for English speakers. And in case these are not enough, our robot bears are hard at work building new courses and finalizing the French curriculum. Stay tuned for a wider variety of languages! To use Chatterbug past the initial trial period, you must subscribe to one of our plans or buy a live lesson bundle. Our Plans Our study plans start at $18/€15 per month. All plans include one or more Live Lessons per month. See the pricing section for more details. Our Bundles Bundles are the perfect alternative if you do not have a credit card and would rather pay via PayPal. You can purchase live lessons in bulk and you’ll get full access to our curriculum for 6 to 8 months, while your credits are active. It’s up to you! The more you study, the faster you get better. Spending about 2 hours a week in self-study and 2 Live Lessons per week—a total of 3.5 hours per week—will typically get you from a complete novice to CEFR’s A1 (basic communication skills) in about 5 to 6 months. Going from A1 to A2 (routine conversations) would take a similar amount of time. Nope! You can take our placement test before you start studying and immediately jump ahead to your current level. You can also retake the placement at any time if you don’t think you’re at the right level. Yes! Chatterbug is also available on iOS and Android. Currently the mobile app supports the entire self study program, including card study, reading and writing exercises, as well as video and podcasts. Live Lessons are guided, 45 minute, one-on-one video chats with native speakers of the language you are learning. Learn more on the home page. To put it plainly, yes. There are many tools out there that help you practice vocabulary or study grammar, but without conversations with real humans, using your new language skills in the real world will be very difficult. You may find you know many words, but cannot understand anyone speaking or form complete sentences on your own. No. Self-study and Live Lessons are like peanut butter and jelly—they are pretty good on their own, but way better when used together. Self-study will teach you vocabulary and language rules that you will use in the Live Lessons; the Live Lessons will reinforce the vocabulary and rules by using what you learned during real conversations. Live Lessons bring together all of your efforts and really teach you to speak the language. But you have to work concurrently on building your foundation of vocabulary and grammar so you have the raw materials you need to benefit from the Live Lessons. We make this part super easy—no coordination involved. You select the times you want to take lessons each week, and we pair you with tutors that are available during those times. Per our Terms of Service, children under 18 but over 13 years old may use Chatterbug with the approval of a parent or guardian. Chatterbug is not currently available to children under the age of 13. We care about your child’s privacy, and since our program includes video chats with tutors, we comply with the US Children’s Online Privacy Protection Act (COPPA). This is not a goodbye, though, just a see you soon! Only if you want them to be. If you opt in, you will be able to go back and see replays of all of your old lessons including video, audio, chat messages, and exercise information for each lesson. As a student, the recordings can be very useful to see your progress, and to jog your memory of tips from your tutors. You can select one of 3 options: don’t record at all, record only for your use, and record for your use plus our research. In the second option (record for your use), we do nothing with your recordings—they are yours for your own benefit. The third option (for your use plus research) allows us to use the videos for research purposes to improve Chatterbug and our curriculum. Your recordings will not be made public or otherwise shared outside the people improving the system. You don’t need to be! After you sign up, you will select one of 3 options: don’t record at all, record only for your use, and record for your use plus our research. After signup, you can change this setting any time in your account settings. Yes! Once you sign up to Chatterbug, you have access to all of our language courses. Whether you want to learn German, Spanish, French, or all of the above, the ball is in your corner. You can easily add a new language to your study plan via your Dashboard. Not at this time. All of our Live Lessons are one-on-one, but we’re working on a feature that will allow you to study with your friends. You’ll be able to keep up with their progress and compete with them. Ready, set, go! Nope, we think it’s helpful for you to hear different accents and speaking styles just like you would in real world conversations. So we pair you with a variety of native speakers for your Live Lessons. However, if you have a favorite tutor you would like to work with often, you can signal your preference in our tutor management tool and we’ll pair you with them as often as possible. You’ll have a tutor management tool on your dashboard that allows you to record your tutor preferences. There you can favorite tutors you’d like to work with often, and unfavorite or even block tutors you did not click with. If you ever want to end a Live Lesson early for any reason, you can do so by pressing the button that says “End Session Early”. You will also have the opportunity to rate your tutors at the end of each session so we can anonymously reach out to them if there’s something they should improve. It is very important to us that everyone has a positive experience, and that’s why we regularly screen our tutors for friendliness and helpfulness. It’s very easy to switch plans or cancel your subscription with Chatterbug. On your Payment page you’ll have the option to ‘upgrade, downgrade, or cancel your subscription’. Fill in the tutor application page. This part is easy and straightforward. We ask a series of questions regarding your experiences and basic info. This should be answered in English, our official company language. Send in a 30 - 60 minute video about yourself: After we have approved your application, we will ask you to send us a short video in order for us to ‘get to know’ you. In this video you will introduce yourself and show us a bit of your personality. Training Lesson: In this last step of the on-boarding process, you will set up a training lesson with one of Chatterbug’s team members. In this training lesson you will get to know the platform, as well as do some trial exercises. You as the tutor, our team member as the student. 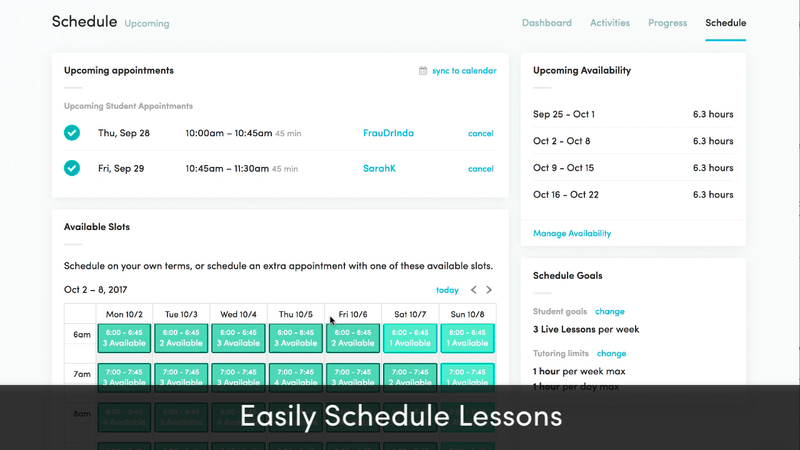 Start Tutoring: If our team member approves you as a tutor, you are free to go into your dashboard and set your schedule. Then, have fun tutoring! As a tutor you will be in 45 minute one-on-one video chats with students. Each lesson has a pre-defined curriculum broken up into 5 to 10 minute exercises that guide the conversation. Since the curriculum is driven by Chatterbug, you do not need to provide your own material or prepare anything beforehand. Check out our tutor application page for more info. Nope. At this time, we only require that you are native in the target language and are a really nice person. No. All curriculum is provided by Chatterbug. The system will show guided exercises to the student that are at the student’s level. Yes. At this time, we require all tutors to allow recording. Some students will have opted out of recording, and in those cases you will not be recorded. You have two options regarding recording: record only for the student’s use, or record for the student’s use plus our research. In the first option (record for the student’s use), we do nothing with your recordings—they are yours for your own benefit. The second option (for the student’s use plus research) allows us to use the videos for research purposes to improve Chatterbug and our curriculum. Your recordings will not be made public or otherwise shared outside the people improving the system. If you’re a good fit, you will receive an email from our curriculum team with further instructions. If you’re not a good fit at the moment, you will also receive an answer with feedback on why your application was rejected. We try to process applications as soon as possible but things get busy so bear with us if it takes some time. We kindly ask that you give us a few weeks before inquiring for updates. We approve tutors based on their availability in timezones where there is student demand. Yes! Please check out Chatterbug for Business.